Against the Nation is Published! Following the German reunification process in the 1990s, a new movement appeared in Germany. This movement rejected all forms of nationalism, including the desirability and legitimacy of national communities, borders, and the existence of the nation-state itself. Against the Nation covers the background of this movement—the rise of Neo-Nazism, racist violence, restriction in immigration policies, and growing state power—as well as its urge to organize society around other principles than nationality. 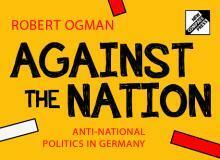 By examining the campaigns and documents of the various anti-national tendencies in Germany during this period, Robert Ogman takes a fresh look at the question of nationalism and its relationship to Left politics.